Today we are going to share you the Top Best Facebook Secret Tricks. Facebook has many secrets that you still don’t know. There is nothing about new to introduce you about Facebook. Facebook is the most popular social site of the world. The owner of the Facebook is Mark Zuckerberg. He gives us the most valuable thing. We need facebook in our daily life for many types of work. We need to be connected all the time with facebook to contact our peoples. That’s why this is the most popular social website. Today we’ll discuss a secret trick about Facebook. The trick name is Invisible Chat. It means only for some friends you’ll invisible from online. Suppose you are in online and some of your friends want to chat with you. They gives you message and if you don’t give them reply they would be angry with you. But you don’t want to chat with them. Now what can you do ? If you are in this type of situation and want to get rid out of this then this is the right place for you. You’ll able to keep yourself hide from your friends. And then you no need to talk with them. You’ll be happy and your time will save much more. So, what are you thinking for ? Let’s know how to do that. Firstly go to Chat found at the lower right side of the page and then, click on gear icon/settings and click on advanced settings. Here you can do three things. 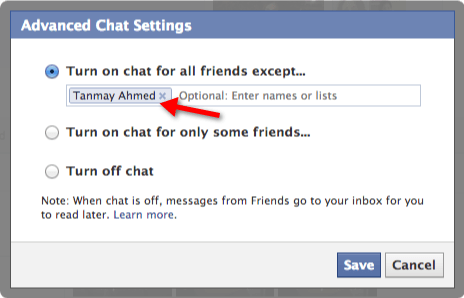 Turn of chat for all contact excepts (your friends name). Turn of chat for only some contact (you want to turn off chat). Turn of chat for all contact. We know that it can help you a lot. Hope you like it. Chatting is important for all of us. But there is some contact that we really don’t want to chat with them. There would be various reason. But if you turn of chat you can lost all of your important friends. 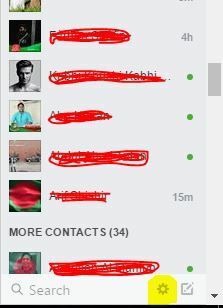 And when you when you turn on your chat there are lot of contact who want to chat with you. But you need some special friends on your contact. In this situation Invisible Chat can help you a lot. Already you know how can you do it. By doing this you can chat with them only you want to. And of course you can do it very easily. There is just 3/4 steps to do that. So, friends enjoy this trick. You can share it with your friend to know about this by sharing our link. If you like it then share our link to your friends and family and of course stay with us to get more new awesome tricks.